According to blogger Jack Sullivan, “Around the end of the 19th Century a series of hucksters, promising remedies for various ailments, centered on the lowly fig as an elixir of great potency and healing. Figs are known to have a mild laxative effect and it was that quality that spawned the widespread sale of fig remedies. Among the most notable was the “Syrup of Figs” produced by the California Fig Syrup Co. of San Francisco. It came in labeled, embossed bottles that sold in drug stores across America at the not inconsiderable cost of a half dollar. Advertising card for the California Fig Syrup Co. San Francisco, front. Advertising card for the California Fig Syrup Co. San Francisco, back. Ad from 1893 Columbian Exposition in Chicago for California Fig Syrup. 1895 Ad for California Fig Syrup Co.
1920 Ad for California Fig Syrup Co.
35 Responses to California Fig Syrup Co. San Francisco, Cal. Hello from New Zealand! A bottle identical to the one pictured on this page was recently unearthed on our property in Levin during work on drainage. We are intrigued to know how it might have got here.. Our villa dates from 1910. Several other old bottles of sundry provenance were also unearthed. I have also found a few old bottles and one exactly the same to this one… It’s very interesting!!! Just found a bottle in my garden, my cottage was built in the 1700’s in Bethersden, Kent UK. I realise that the product was purchased in the 1800’s, obviously a very successful International product. i just found one that looks the same as the one pictured at an excavation site for a new high rise building in yeppoon central Queensland Australia makes you wonder doesn’t it???? My husband just found one digging up an old fence post on our family farm in Southern Illinois. We’re just over an hour from Evansville. A friend just found one of these embossed bottle lying on the banks of the Assiniboine River in Winnipeg, Manitoba, Canada yesterday…..
Found the identical bottle as the one pictured here in Highlands County Florida,, USA. Property was owned by family that had been in this area from the late 1700’s. I found one in Barrow, Lancashire, UK. And other one with something inside, water with something shining, like pieces of metal. On the bottle is the inscription: Poison, not to be taken. The bottle is full, corked. Someone know what it can be? I found it underground, while digging. I’m no expert, but that sounds like mercury! Found one identical to one pictured in my garden in llanfairtalhairan in north wales today while gardening. Just found one under the old house during demo … has Australia embossed. Found same CALIFIG bottle while moving earth with tractor. Other bottles and dishes mostly broken. Still very fun and interesting. I would like to eat a fresh fig thinking of them. Location State of Oregon, USA. I have a bottle marked Califig – successor to the California Fig Company. I wondered when they changed to Califig? I found one in a brook/steam running through a customers garden at a place called Hungerford Bottom,Burlesdon,Southampton,England along with many other different bottles too with the vast majority being unfortunately broken which I duly recycled. The intact ones i have kept having been through the dish washer on numerous cycles to try and shift the decades of stains and marks left by the water. One can only presume they were discarded further upstream all those years ago before being washed down through storms etc. None the less an interesting piece of social history having highly likely been imported through Southampton Port a few miles down the road. Perhaps a Titanic passenger discarded it before heading off on that ill fated voyage? One does wonder. I’ll guess we shall never know! Just found one washed up on beach at Kerrycroy, Rothesay, Isle of Bute, Scotland. Exactly like the picture. In great condition. Just found an old cardboard box with California Syrup of figs printed on box. Just wonder what date this might be from. 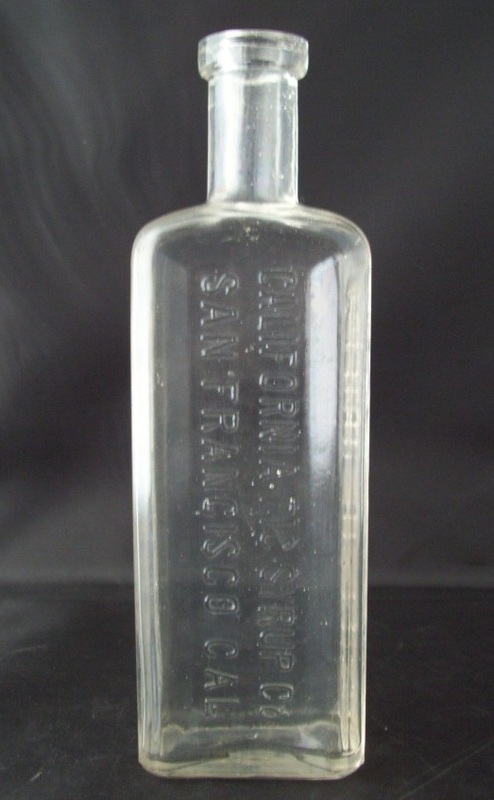 Just bought a California Fig Syrup Co. bottle at an antique store in Roseville, CA and paid $5.00. I found a found bottle california Fig Syrup CO by fortress near Schilde Antwerp Belgium. I found one of these along with others yesterday at the mouth of a Badgers Set in a park in Hawkwell Essex. I just dug one up this afternoon in my garden in Whakatane, New Zealand.